The National Weather Service In San Angelo Has Issued A * Severe Thunderstorm Warning For... Coke County In West Central Texas... Northeastern Sterling County In West Central Texas... Southwestern Nolan County In West Central Texas... * Until 1030 Pm Cdt. ...Read More. ...a Severe Thunderstorm Warning Remains In Effect Until 1000 Pm Cdt For Southeastern Eastland And Northwestern Comanche Counties... At 948 Pm Cdt, A Severe Thunderstorm Was Located Near De Leon, Or 14 Miles North Of Comanche, Moving East At 35 Mph. Hazard...60 Mph Wind Gusts And Quarter Size Hail. Source...radar Indicated. ...Read More. ...a Severe Thunderstorm Warning Remains In Effect Until 1000 Pm Cdt For Northern Johnson And Tarrant Counties... At 944 Pm Cdt, A Severe Thunderstorm Was Located Near Haltom City, Or Near Richland Hills, Moving East At 35 Mph. A 70 Mph Wind Was Measured At The Nws Office In Fort Worth. Hazard...70 Mph Wind Gusts And Penny Size Hail. ...Read More. The National Weather Service In Midland Has Issued A * Severe Thunderstorm Warning For... North Central Pecos County In Southwestern Texas... Southeastern Ward County In Western Texas... Crane County In Western Texas... Western Upton County In Western Texas... ...Read More. ...a Severe Thunderstorm Warning Remains In Effect Until 1000 Pm Cdt For Central Sterling County... At 932 Pm Cdt, A Severe Thunderstorm Was Located 9 Miles Northwest Of Sterling City, Moving East At 25 Mph. Hazard...ping Pong Ball Size Hail And 60 Mph Wind Gusts. Source...radar Indicated. ...Read More. GRAPELAND – Field Representatives Michael Ethridge and Craig Lewellyn – with U.S. Congressman Kevin Brady’s office – discussed tax reform legislation put together by Rep. Brady (R-Texas) during the Grapeland Noon Lions Club meeting on Thursday, Feb. 2. Ethridge began the presentation and thanked the club for welcoming him to Grapeland. “I go around and meet with groups who provide service to the community and say thanks and answer any questions you may have,” he said. Ethridge explained both he and Lewellyn worked for Congressman Brady who was the Chairman of the House Ways and Means Committee, the chief tax writing committee in the U.S. House of Representatives. The field representative distributed several pieces of literature and said one of the items displayed a proposed tax form which contained only 14 line items. The line items listed on the postcard were: 1) wage and compensation income; 2) add one-half of investment income; 3) subtract contributions to specified savings plans; 4) subtract standard deduction or; 5) subtract mortgage interest deduction; 6) subtract charitable contribution deduction; 7) taxable income; 8) preliminary tax (from tax table); 9) subtract child credit; 10) subtract earned income credit; 11) subtract higher education credit; 12) total tax; 13) subtract taxes withheld; and 14) refund due / taxes owed. “This is the type of simplicity we are looking for,” Ethridge explained. As he continued, Ethridge said there were three key elements in Brady’s tax code proposal. The first element concerned families, individuals and a reduction in the number of different of tax brackets. “We want to lower the corporate tax rate and make it easier for businesses to grow. One of the key components in this is to be able to write off 100 percent of your business expenses in year one,” he said. The third element in the tax reform proposal is “… busting up the IRS,” Ethridge said. Ethridge said under Brady’s proposal the IRS would become three much smaller units with one focused on helping businesses, another focused on families and individuals and the third unit would be a small claims court to help resolve tax disputes. 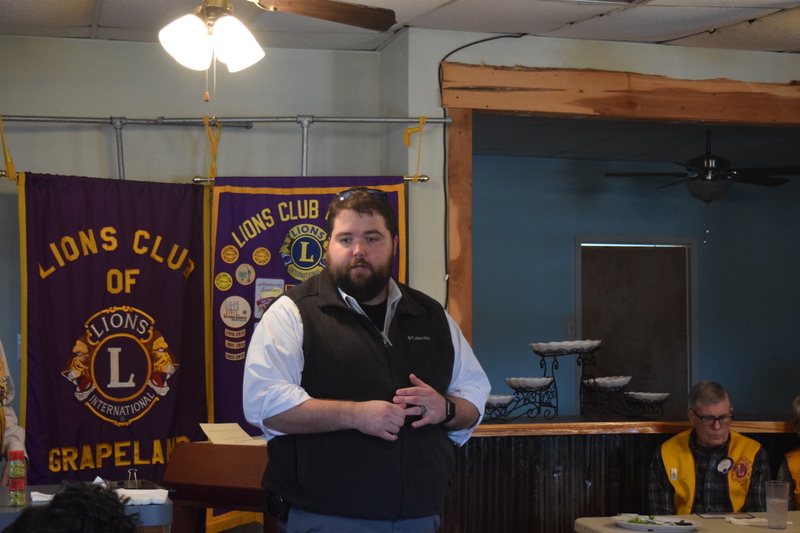 Prior to the tax reform discussion, Lions Club President Ben Childress provided the club with an update on the club’s old business and upcoming projects. The first project discussed was the repair of see-saws at the Grapeland City Park. Childress said the see saws had been painted and were ready to have metal, fabricated by Vulcraft, placed on them. It was determined the playground equipment would be re-installed, tentatively, within the next. Childress also informed the club of the retirement of Lions Treasurer Velda Parker, who retired from the post office at the start of the month.